Pro-abortion advocates at the University of North Carolina took obscene photos and made profane jokes at a memorial of crosses pro-life students had set up to remember the lives of the unborn. Just as we saw last week with a professor at University at Buffalo, pro-aborts just don’t seem to be able to express their own views without resorting to profanity. At UNC-Chapel Hill, pro-abortion students proudly took pictures of themselves or jumped in the pictures of others making obscene gestures in front of the Planned Parenthood Project display. 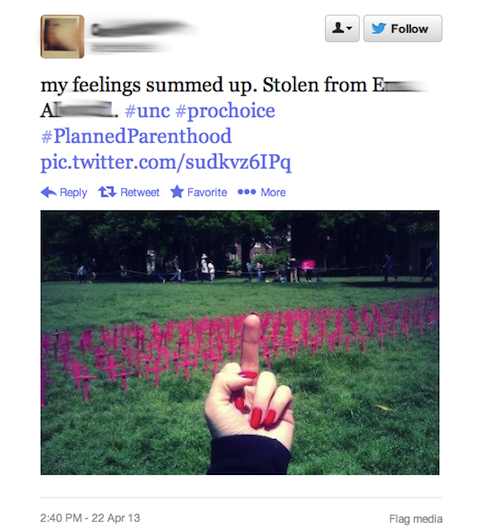 One tweeted: “articulated my anger at the anti-Planned Parenthood activists by ripping up their flyers, shouting ‘F[***] THE FOETUSES’ (sic) and photobombing them.” If that’s what counts as articulate debate at UNC-Chapel Hill, the Tar Heels are in a lot of trouble. It’s appalling to read about. But the pictures are the most damning evidence of all.